Disney's Zootopia took in $4.69 million on Tuesday to continue to lead the daily box office. The blockbuster 3D computer animated film from Walt Disney Animation Studios has now led the daily box office for 18 of the past 19 days. 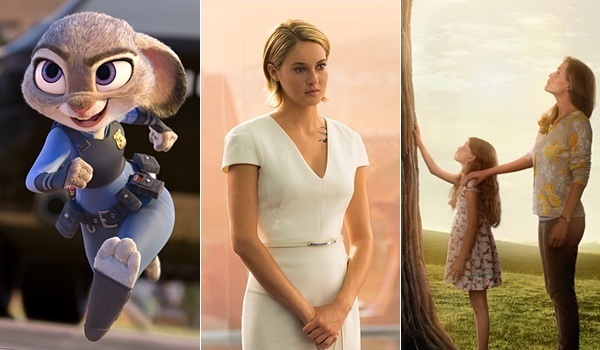 Zootopia was up a healthy 26 percent over Monday and down just 23 percent from last Tuesday. Daily grosses in general on Tuesday continued to be helped out by those off for Holy Week. Zootopia has grossed a very impressive $209.34 million in 19 days. That places the film 48 percent ahead of the $141.20 million 19-day take of 2014's Big Hero 6 and 19 percent behind the $257.29 million 19-day gross of last year's Inside Out. The Divergent Series: Allegiant took second place with $2.49 million. The third installment of Lionsgate's young adult franchise starring Shailene Woodley increased 23.5 percent over Monday's performance. Allegiant continues to run below its already scaled back pre-release expectations with a five-day start of $33.54 million. The film is currently running a very underwhelming 43 percent behind the $59.18 million five-day gross of last year's The Divergent Series: Insurgent (which increased 19 percent on its first Monday to gross $3.76 million). Sony's Miracles from Heaven grossed $1.99 million to remain in third. The modestly budgeted faith-based film starring Jennifer Garner was up a very strong 47 percent over Monday. Miracles from Heaven has grossed $21.71 million through seven days. The film is performing in line with expectations and well with its modest production cost in mind. Miracles from Heaven is currently running 37 percent behind the $34.48 million seven-day take of 2014's Heaven is for Real and is likely to make up ground in the comparison going forward thanks to strong word of mouth. Paramount's 10 Cloverfield Lane followed in fourth place with $1.44 million. The J.J. Abrams produced thriller starring Mary Elizabeth Winstead and John Goodman increased 18 percent over Monday and decreased 44 percent from last Tuesday. 10 Cloverfield Lane has grossed $47.85 million in twelve days. That is towards the higher end of expectations and places the film 8 percent ahead of the $44.16 million twelve-day gross of last year's The Visit. Deadpool rounded out Tuesday's top five with $0.989 million. The Ryan Reynolds led blockbuster antihero film from Fox was up 14 percent over Monday and down 30 percent from last Tuesday. Deadpool continues to pad its total as the highest grossing release of 2016 thus far with a massive 40-day total of $342.81 million. Deadpool is likely to start falling off much harder when Warner's Batman v Superman: Dawn of Justice enters the marketplace on Thursday evening. London Has Fallen placed in sixth with $0.831 million. The action thriller sequel from Focus and Gramercy increased 24 percent over Monday and decreased 38 percent from last Tuesday. London Has Fallen has grossed $51.54 million in 19 days. That is in line with pre-release expectations, but is 29 percent softer than the $72.96 million 19-day gross of 2013's Olympus Has Fallen. NEW YORK March 22, 2016 - Today, MoviePass, the nation's premier moviegoing subscription service, released third-party data that measured how frequently MoviePass subscribers went to the movies during a 12-month study that was conducted throughout 2015. The study revealed that MoviePass subscriptions drive a 111% increase in attendance. "The MoviePass subscription model is the most effective way for our industry to engage young, tech- savvy customers in today's competitive landscape," said Stacy Spikes, CEO and co-founder of MoviePass. "We are a data driven company that uses intelligence to empower studios and exhibitors to drive attendance and have a deeper relationship with their customers." "This trial confirms quantitatively that the subscription business model MoviePass has created is delivering real value to movie studios, theaters, and audiences," said Mather Economics President, Matt Lindsay. "We're big believers in MoviePass because of their data-driven approach to subscription, which helps us to better understand our most avid moviegoers and more effectively drive traffic to the theatrical window." Matthew Marolda is Chief Analytics Officer at Legendary Pictures. Boca Raton, FL March 22, 2016 - MovieTickets.com, a leading global provider of remote movie ticketing, has entered into a deal with Canada's Landmark Cinemas, which has locations throughout Western Canada, Ontario, and the Yukon Territory. This new relationship with Landmark Cinemas will continue MovieTickets.com's dominance in Canada where it now offers advance tickets for nearly 75% of the screens within the country, representing over 90% of the country's box office on any given weekend. "We look forward to increasing our presence in Canada to include Landmark Cinemas," said Joel Cohen, CEO of MovieTickets.com. "Our own expansion within the Canadian market builds on our International growth strategy, this is especially valuable in a country where we are the only destination that aggregates advance ticketing from multiple theater chains." Bill Walker, COO of Landmark Cinemas Canada, added, "MovieTickets.com is a great partner in Canada and will help extend convenient ticketing platforms to our guests." Landmark Cinemas is the second largest motion picture theatre exhibition company in Canada, and the 10th largest in North America. This deal adds an additional 45 theatres and 312 screens to MovieTickets.com bringing the company's global footprint to nearly 29,000 screens. Moviegoers in Canada can visit both www.MovieTickets.com and www.MovieTickets.ca to purchase advance movie tickets. Both sites are offered in English and French to cater to the country's two primary languages. Disney's Zootopia grossed $3.72 million on Monday to remain in first place at the daily box office. The blockbuster 3D computer animated film from Walt Disney Animation Studios has now led the daily box office for 17 of the past 18 days. Zootopia was down 67 percent from Sunday and down a slim 19 percent from last Monday. Daily grosses in general on Monday were helped out by those off for Holy Week. Zootopia has grossed a very impressive $204.65 million in 18 days. That places the film 48 percent ahead of the $137.93 million 18-day take of 2014's Big Hero 6 and 18 percent behind the $250.85 million 18-day gross of last year's Inside Out. The Divergent Series: Allegiant took second place with $2.02 million. The third installment of Lionsgate's young adult franchise starring Shailene Woodley was down 68 percent from Sunday's performance. Allegiant passed the $30 million mark yesterday and has grossed $31.05 million in four days of release. The film is running below its already scaled back expectations and a very underwhelming 44 percent behind the $55.42 million four-day start of last year's The Divergent Series: Insurgent (which fell 72 percent on its first Monday to gross $3.16 million). Sony's Miracles from Heaven claimed third with $1.35 million. The modestly budgeted faith-based film starring Jennifer Garner fell 70 percent from Sunday. Miracles from Heaven has grossed $19.72 million in six days. The film is performing in line with expectations and is performing well with its modest production cost in mind. Miracles from Heaven is running 38.5 percent behind the $32.04 million six-day take of 2014's Heaven is for Real, though Miracles from Heaven wasn't expected to perform as strongly as Heaven is for Real did and could potentially display stronger holder power. Paramount's 10 Cloverfield Lane followed closely behind in fourth place with $1.23 million. The J.J. Abrams produced thriller starring Mary Elizabeth Winstead and John Goodman declined 64 percent from Sunday and a solid 41 percent from last Monday. 10 Cloverfield Lane has grossed $46.41 million in eleven days. That is towards the higher end of expectations and places the film 7 percent ahead of the $43.21 million eleven-day gross of last year's The Visit. Deadpool rounded out Monday's top five with $0.865 million. The Ryan Reynolds led blockbuster antihero film from Fox was down just 61 percent from Sunday and down 26.5 percent from last Monday. Deadpool continues to pad its total as the highest grossing release of 2016 thus far with a massive 39-day total of $341.82 million. Deadpool is likely to start falling off much harder when Warner's Batman v Superman: Dawn of Justice enters the marketplace on Thursday evening. London Has Fallen placed in sixth with $0.670 million. The action thriller sequel from Focus and Gramercy fell 66 percent from Sunday and 34 percent from last Monday. London Has Fallen has grossed $50.71 million in 18 days. That is in line with pre-release expectations, but is 29.5 percent softer than the $71.98 million 18-day gross of 2013's Olympus Has Fallen. LOS ANGELES - March 23, 2016 - "Batman v Superman: Dawn of Justice" is rising to the top of Fandango's Fanticipation movie buzz indicator, scoring an almighty 98 out of 100 points. Zack Snyder's new movie is in a league of its own, topping presales for all superhero movies at the same point in the Fandango sales cycle, beating previous record-holders, "The Dark Knight Rises" and "Avengers: Age of Ultron." The film currently represents more than 90% of this weekend's ticket sales on Fandango. · 59% are rooting for Batman; 41% are rooting for Superman. 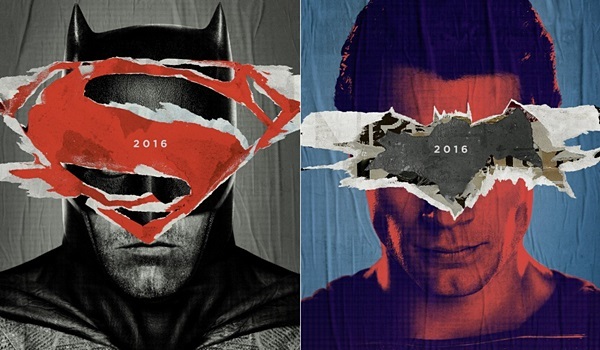 "Off-the-charts fan excitement for the mashup of the two iconic superheroes has resulted in huge advance sales for ‘Batman V. Superman: Dawn of Justice,'" says Fandango Chief Correspondent Dave Karger. "All signs are pointing to a massive opening. Meanwhile, lasting affection for Nia Vardalos' quirky big-screen family will lead to a festive debut for ‘My Big Fat Greek Wedding 2.'"